Tanney re-signed with the Giants on Monday, Art Stapleton of The Bergen Record reports. Analysis: Tanney did not see any game action during 2018, his first season with the Giants. 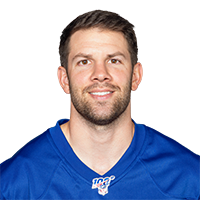 With Eli Manning expected to be retained and the possibility of another QB being brought in via the draft or free agency, Tanney will compete with 2018 fourth-round pick Kyle Lauletta for a backup or third-string role. Tanney will work as the No. 2 quarterback in Sunday's game versus the Titans, Paul Schwartz of the New York Post reports. Analysis: Tanney has been a healthy inactive for every game this season and will finally get a chance to suit up with Kyle Lauletta sitting out. With the game out of hand in Week 14, Lauletta was put in but didn't complete any of his five passing attempts and threw an interception. Tanney will likely only see the field if the Giants have a substantial lead again. Tanney is inactive due to coach's decision for Sunday's tilt against Chicago, Art Stapleton of The Bergen Record reports. Analysis: Tanney has operated as the primary backup behind Eli Manning this season, but it appears he's dropped to No. 3 in the lineup behind rookie Kyle Lauletta. It was previously reported that Tanney could get some run late this season with the Giants sitting at 3-8. The switch could indicate the team is happier with what it's seeing in practice from Lauletta, and the rookie could see action before Tanney does. Tanney will likely take snaps under center at some point during the 2018 season, a source tells Ralph Vacchiano of SportsNet New York.